I can't remember this one at all! I'll have to go back and check my Sonic archives sometime! Was it more of a parody cameo than official cameo? It was certaily "lawyer-friendly" since both TMNT and Sonic had comics being published by Archie at the time. As official as the Turtles appearing in Shattered Image and Mars Attacks Image, I'd say. A one-panel gag, but they're not drawn as approximations or parodies but as the proper TMNT. Ninja Turtle comic reviews, essays, articles and more! You also list the Deluxe edition of #1 under "collected books". I'll double check the indicia on this one, but I know quite a few people (myself included) that consider that the 6th print. It is indeed the sixth printing; it's right there in the indicia. Yeah, I noticed that too after checking, but I've always thought of the Special Edition more as a well, Special Edition, lol, rather than a reprinting proper; the mislabelling under collected books was due to me working on this thing late at nights - I'm well aware it isn't a collected book. On another note, if someone has a comprehensive listing of the foreign Turtle books (UK, Italian, Japanese, etc), I'd be more than glad to add them to the list. I've been curious about the Titan Dreamwave books myself; I have the US version of Volume 1, so how do the UK books differ (aren't there two)? Thanks, you beat me to it. Don't forget the 2nd print #4 Error Variant. Yeah, I knew which book you were referring to. Adding to the list. Thanks for adding my suggestions. Plastron Cafe should probably go under the Mirage header, since they published it. Likewise, Sonic #10 should probably go under the Archie header. And since there seems to be a lot of Image cameo and crossover issues, maybe that should get its own header? You are doing a good job there with all the listings venom , you might want to add under the Collected books for TMNT25th theres soft and hard covers also under the Miscellaneous turtle stores Creed/TMNT the hybrid cover plus there are signed versions for the Trent and Laird covers and theres a limited edition version for the American entertainment cover, theres far to many variants for that comic 9 in total. Last edited by kool75uk1; 11-11-2010 at 09:40 AM. Just hit up Mirage's website. All those books' covers are shown there. Sure Spengs, thanks for reminding me about those! Branching off into sub-categories like Mirage Books, etc. is something I've been toying with since I've wound up buying most of Mirage's comics this year (sans Bade Biker, Rockola, Paleo, Puma Blues or Kevin's Tundra-published books). Thanks! Sooo true about the variants of this book being ridiculous! It epitomizes the redundancy of the '90's speculative market. BTW, what do you mean by hybrid cover? To be fair, this book is actually listed two or three times, even on Mirage's site. The Mirage SOTO adaptation was actually published by Tundra and is also the Archie Prestige version. Unless I'm mistaken on that last point. I've been trying to research this for a while and cannot discern any noticable differences between the two. I don't know if it's worth mentioning, but I've got a copy of TMNT Vol. 2 #13 that has the front and back covers reversed. 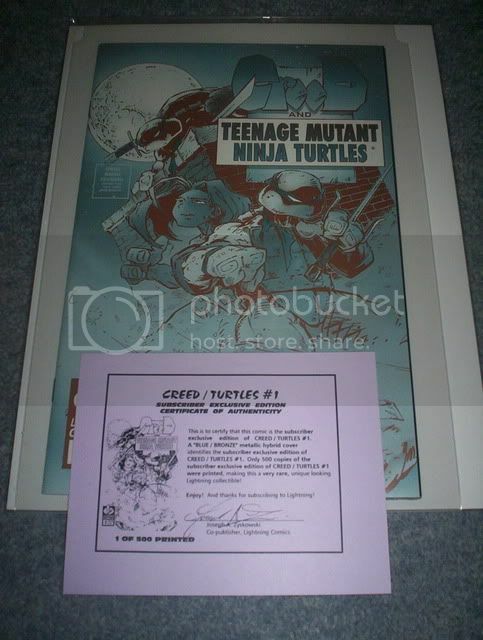 That is, the ad for the TMNT/Creed crossover is on the front of the book, and what should be the front cover is on the back. They're TPBs, but not the collected books you asked about above. Those are the colored reprints by First Comics. They're listed here as "TMNT Book I," and so on. There were four of 'em, and combined they collected issues 1–11 as well as the Leonardo one-shot. All of the "TMNT Collected Book Volume One"s are phonebook-esque books (save for the hardcover edition of the first publishing) that reprint issues 1–11 plus all four microseries/one-shots (though the one published last year also contains the Fugitoid one-shot). I see hardcovers of the 25th anniversary book on eBay from time to time. I'd certainly love the hardcover edition of the first print of the Collected Book 1 as well. ;) Heck, I'd like the paperback edition of that print as well. man i've yet to see the 25th anniversary book on eBay! and this http://miragelicensing.com/comics/bo...t01deluxe.html is hardcover right? It's both. There was a limited run of hardcover copies (200, I think), another item I covet. The softcover is still sold by Mirage, under the "Mirage Studios - Collected Books" section, for $6. It's a cool reprint, showing the sepia tones of the DuoShade paper before being copied to black and white (or "black and yellow," perhaps I should say). cool beans! i for sure would love the hardover, but it's hard ti find. what's a good price for the hardcovers of the 25th anniversary book?